Wrapped and ready to be gifted! Or eaten. By me. I went on a weekend road trip with some friends last week, doing some cross-border Christmas shopping (I *may* have done some shopping for myself) in the Niagara/Buffalo area. My friends and I went into a shopping area in Niagara and saw a candy shop, which of course I had to go into. It was a make-your-own chocolate bar shop, with walls of chocolate and candy, as far as the eye could see. There were some children there, making their own chocolate bars, and I watched as the staff instructed them through the process. When I realized how simple it was, I couldn’t believe that people paid a premium for it. So obviously I had to replicate it for myself! This makes for a great last-minute Christmas gift, especially if you want to get children involved in gift-giving. They can choose the candy toppings, and actually help with the whole process, because it’s just so unbelievably simple. I also think this would be a great activity for a kids’ birthday party — the kids could go home with their own customized chocolate bar! Activity and loot bag in one! Have I piqued your curiosity and/or appetite yet? Let’s get candy-making! All you need: candy and chocolate wafers. And the willpower not to eat it all right away. Melt the wafers in a mug in the microwave in 15 second bursts, stirring it each time you check it. When it is melted, pour it into your plastic container. 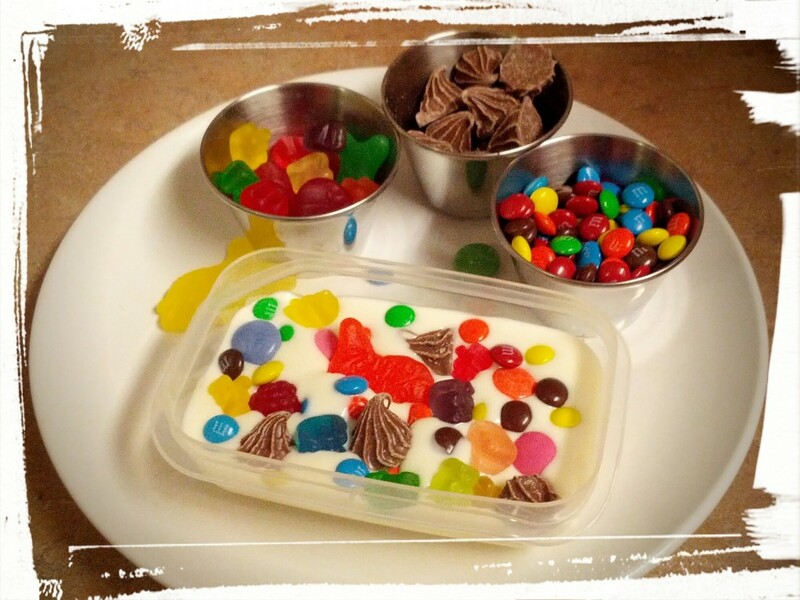 (You don’t need a fancy chocolate mold — I used a mini Ikea food storage container. As long as it’s plastic, it’s all good!) Give the container a good tap on the counter to get any air bubbles out. Sprinkle the candies on top. Place in fridge until chocolate is set. Turn container upside down and de-mold. Wrap in a cellophane bag. Keep in a cool place until eaten. Revel in your inner Charlie-And-The-Chocolate-Factory! I didn’t provide any quantities in the recipe ingredients, because it really depends on the size of your plastic container and your personal candy preference. The combos are endless: white chocolate bar with malted milk balls; rice krispies in milk chocolate; the list goes on! 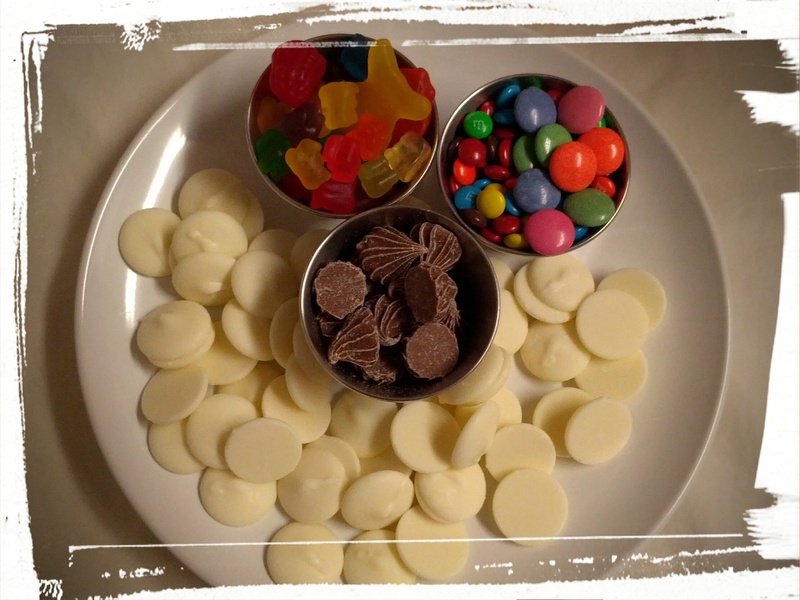 What’s your favourite chocolate & candy combo? Let me know in the comments! 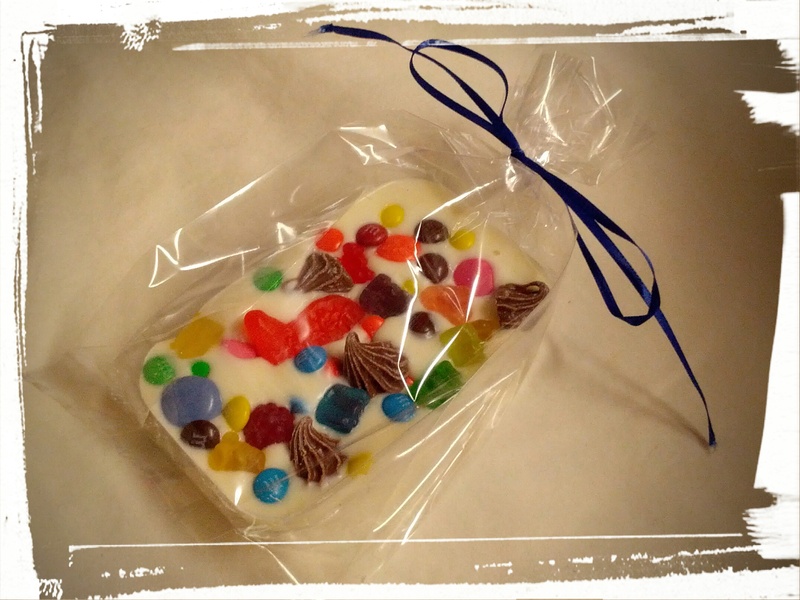 Next Post: More candy confections! This time, Chocolate Candy Cane Bark! Linking Up at Candy Plan Monday! And at Meal Plan Monday! This entry was posted in Desserts Not Otherwise Categorized, Snacks on December 21, 2014 by Margaret.